The Ontario Superior Court of Justice has voided a release signed by a Home Depot employee during a termination meeting, finding the employee didn’t have a chance to think about it and seek advice before signing. Rubin’s termination letter stated that Home Depot’s statutory obligation to pay in lieu of notice was 27 and three-quarters weeks, but he was being offered 28 weeks’ pay as well as medical, dental and life insurance benefits for that period, in exchange for signing a release waiving his right to legal action against the company. The letter also said his short-term and long-term disability benefits would be continued for eight weeks, equal to the statutory minimum notice. No mention was made of Rubin’s accidental death and dismemberment benefits, which were also required to be extended for eight weeks by employment standards legislation. The letter indicated that Rubin could have a week to review and sign the release, but Rubin — unaware of his common law and statutory rights — thought the offer was the best he could get and signed the release. Later, he realized he had made a mistake, contacted legal counsel and challenged the enforceability of the release. Hope Depot argued he was not pressured into signing the release and he was given a chance to carefully read it. 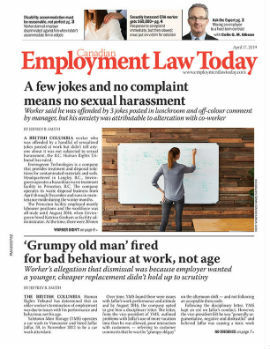 The court found that the offer of six months’ pay and benefits in lieu of notice — only a few days more than the statutory minimum — for an employee of 20 years with a job requiring a significant amount of skill and experience, was “far removed from what the community would accept,” particularly considering he was not being terminated for cause. The court also found that although the letter stated Rubin had a week to sign the release, Rubin was made to feel he needed to sign the release immediately. It was attached to the letter, which stated he would receive his termination pay provided he signed, which implied that he wouldn’t receive anything if he didn’t sign. Had he been aware of his legal rights, he would have known this wasn’t the case, said the court. The court found the release was unenforceable because Home Depot used its “superior position to mislead” Rubin into signing it. Hope Depot was ordered to pay Rubin 12 months’ salary and benefits in lieu of notice, based on his job responsibilities, 20 years of service, and the small likelihood he could find comparable employment at his age. •Rubin v. Home Depot Canada Inc., 2012 CarswellOnt 6660 (Ont. S.C.J. ).